We love when our team members share their stories, especially when it shows growth within their career at Presbyterian SeniorCare Network. 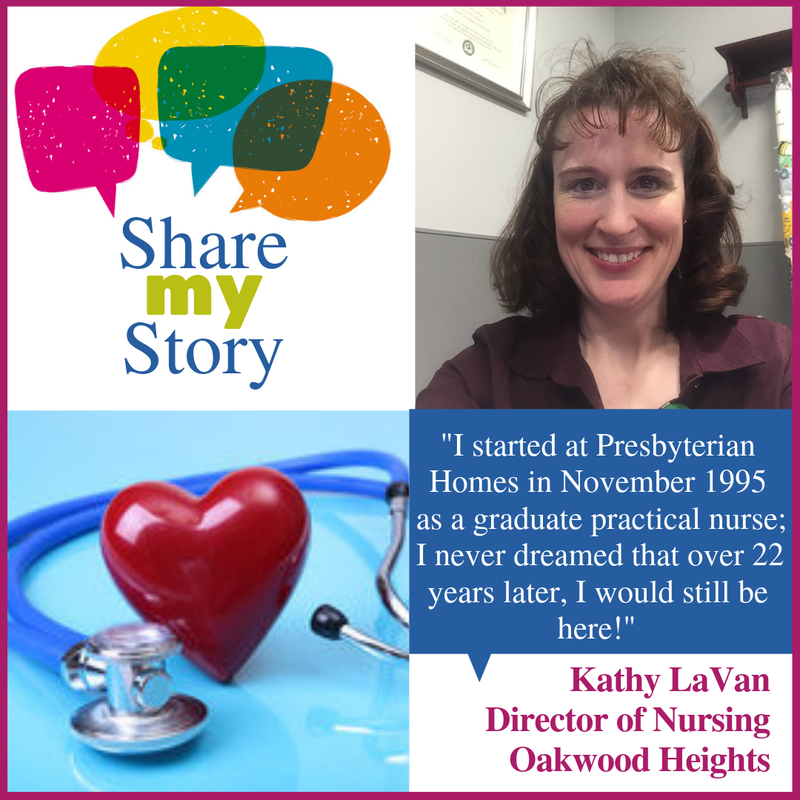 Read about Kathy LaVan, Director of Nursing at Oakwood Heights, our Oil City campus, and why she has stayed with us since she became a nurse 22 years ago! “I started at Presbyterian Homes (now Presbyterian SeniorCare Network) in November of 1995 as a graduate practical nurse. I never dreamed that over 22 years later, I would still be here. Those first few years, I was as scared as can be! I had patient teachers and even more patient residents as I learned to be more competent in my nursing skills. The residents I provide care to became part of my family, and watched me as my family grew to include three beautiful children. Through the years, I have sat with residents as they passed away, held hands with family members and provided comfort to families, residents and team members during difficult times. I had wonderful nurses who mentored me and coached me when I needed it. My hope is to pass my knowledge and experience on to the next generation of nursing to instill in them the art of caring for people. Like Kathy, do you have a story about Presbyterian SeniorCare Network that you would like to share? We would love to hear it! Click here to visit our web page. Once there, please click on the button, Share My Story. Once you have submitted your story, you will automatically be entered into a random drawing to win a $50 Visa gift card! Winners will be pulled the first Monday of every month. We love when our team members share their stories, especially when it shows their love for our residents! Read about Rachel Ellis, a CNA at The Willows, the skilled nursing community at our Oakmont campus, and how putting together a puzzle blossomed into a friendship. “I've been working at Presbyterian SeniorCare Network for five years. At first, I was as a team member at Westminster Place, our personal care community, for a little over a year before I decided to become a CNA and work at The Willows, our skilled nursing community. Like Rachel, do you have a story about Presbyterian SeniorCare Network that you would like to share? We would love to hear it! Click here to visit our web page. Once there, please click on the button, Share My Story. Once you have submitted your story, you will automatically be entered into a random drawing to win a $50 Visa gift card! Winners will be pulled the first Monday of every month. We love when our team members share their stories, especially when a childhood dream becomes reality! 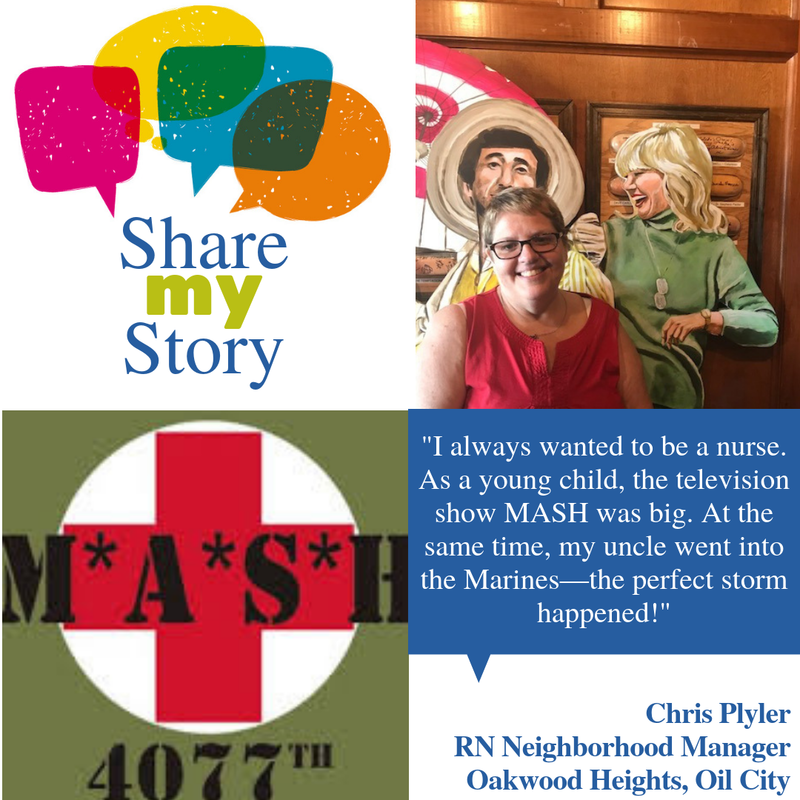 Read about Chris Plyler, a RN Neighborhood Manager at Oakwood Heights, our Oil City campus, and how her favorite TV show led her into nursing. Like Chris, do you have a story about Presbyterian SeniorCare Network that you would like to share? We would love to hear it! Click here to visit our web page. Once there, please click on the button, Share My Story. I have been around older adults my whole life. When I was born, my Mom was the Director of Recreation at the Presbyterian SeniorCare Network Oakmont campus. When she would go to work on the weekends or on a holiday, I would go with her. From summer picnics to trick or treating at Halloween to Thanksgiving dinners and of course, Christmas caroling, I was right there enjoying my time with the residents. Being that I was little, I did not understand what was actually transpiring or why my Mom took me with her, but I was having fun so I didn’t mind. When I got older, my Grandma moved into Westminster Place at the Oakmont campus. Anytime I was home with my Mom and she had to go into work, I would ask to go along to visit with her. I would spend hours in my grandma’s apartment playing Sega and pulling YouTube videos up on her computer, singing and dancing around the room for her. When it was time to go to dinner, I loved going with her. She lived right across the hall from the café, so as soon as she opened her door and the other residents saw me, they all got very excited. Whoever was there that day would sit at my Grandma’s table because they liked when someone new was there to talk to (especially someone as young as I was). We would sit in the dining room for hours after dinner, just talking about what I did for fun and how school was going. My Grandma and I always dreaded the “time to go home” phone call from my Mom. It came too soon every time. When I turned 12, it was a big deal. I was finally old enough to volunteer! I had this project in school called the “Pay It Forward Project.” The project meant that I was supposed to do something good for someone, and then that person was supposed to something good for someone else and so on. So I decided to make this project a bit bigger. Instead of just me going to volunteer, I took some friends with me. That summer, myself and four of my friends would go all day every Wednesday and help in the Recreation Department. We did things such as rewrite special events on the whiteboards in the resident neighborhoods and take residents to the Corner Store. Our favorite thing to do was B-I-N-G-O! Sometimes, we would host three different Bingo games in one day. There was one resident in particular from The Willows who just loved us, and we loved her too. She never missed one of our bingo games. She would help us set up and take down, and she would even bring snacks for us and the other residents attending. Every time, right before a game would start, my friend Shannon would say “Okay, we are going to get started, is everyone ready?” And she would say, “Ready for Freddy!” We do not know where “Ready for Freddy” came from, but it made us laugh every time she said it! When I started sixth grade, my Mom became the Administrator at Woodside Place of Oakmont, a specialized dementia care community. I remember being a little nervous to go help out there at first because I was not used to interacting with residents living with dementia and Alzheimer’s disease. My Mom and I talked about the disease and she reassured me that I would be fine with my social skills, and as soon as I walked in, I was. The Woodside Place residents soon became some of my favorites. In my ninth grade Civics Class, we had to have at least an hour of volunteer work each nine weeks. All my friends would ask to come with me to Woodside Place to get their volunteer hours completed. They were nervous at first too, but I told them they would be fine, just like my Mom did for me. They all ended up loving the residents right away, just like I did. Right after I turned 17, I applied for a job as a Dining Services team member at Longwood at Oakmont, the Presbyterian SeniorCare Network independent living community in Plum. Working three to four times a week, and spending an hour with them every time, the residents started to remember my name. This was a big deal to me. Whenever I would volunteer and hear a resident call a nurse or an aide by their name, I would get a little jealous because I always wanted them to remember my name too. But, being there only once a week and not seeing all of them every time made it hard. Now, at Longwood, most of the residents know my name, because after they have finished eating, we will have conversations while I clean up. We talk about anything and everything. One resident told me about how he and his wife started a business. That business did so well that when they retired they were able to travel the world together. Every night at dinner he tells me a different story about the incredible adventures they went on. He reminisced about their long nights in Brazil and their hot days in Cairo. It is amazing to me how he can recall any detail from any city. I look forward to these stories and it is still one of my favorite parts about my job. I believe that intergenerational partnerships are so very important. Even though we have different lifestyles, we can still enjoy things as simple as sharing a conversation. I have learned so much from our seniors over the years, and I’m sure I have taught them quite a bit too. I enjoy going to work to be with my residents every day, and honestly, isn’t that is what it’s all about? 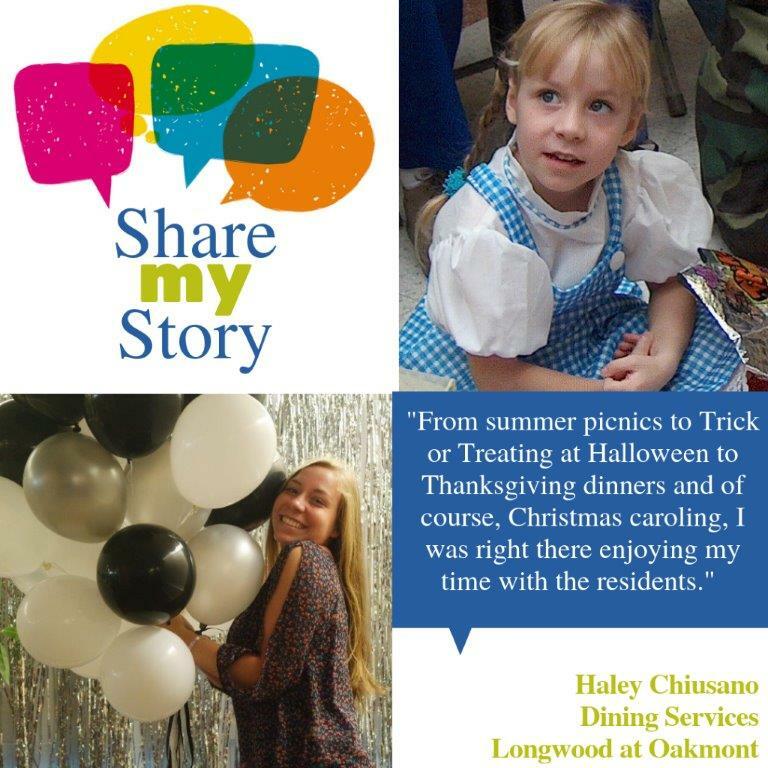 If you are like Haley, and want a career where you can spend your days bonding with our residents, explore careers at Presbyterian SeniorCare Network! “This day, this illness, whatever is troubling a resident, is not who they are as a whole person. Spiritual care or compassionate care involves nurturing the whole person, especially the spirit,” says Susan Blank, director of pastoral care at our Oakmont campus. “This may take the form of organized religious practices, or even non-religious based emotional support. We are here to help the spirit, the emotional and thinking self, which ultimately improves outcomes in life and in health,” she continues. Finding meaning and purpose is not something you can do by sitting still. You will rarely find one of our chaplains in their office – they are all active members at our campuses and are out and about offering their services. A typical day for one of our spiritual counselors can range from leading worship, to one-on-one conversations with residents to offering faith counseling and reassurance to a resident in a time of need. We have residents of all faiths at our campuses; so our chaplains help to organize various types of services and communion so that we are able to serve residents regardless of faith. Our chaplains even review resident census and medical materials to be in the know of resident in need or in crisis. “Our help comes from getting to know our residents and their families so that we can meet them where they are, not where we would like to take them,” says Gary. What Gary is explaining is how spiritual care fits right into our person-centered culture. “Person-centered, I just love that term! Person-centered is what we are all about in pastoral/spiritual care. Each time I visit with a resident, I truly go in with an open heart prepared to listen to each person and their needs. We talk about love, forgiveness, self-worth and so many other topics of importance,” Susan says. Everyone has a need for meaning in life, for self-esteem and belonging. Our spiritual programming facilitates all of those things. Here’s how. At the core of all of our chaplains is a selfless sense of service. Chaplains are often requested when times get tough – when a resident is actively dying or in a health crisis. But the relationship they build with a resident starts shortly after arrival on campus. Needs vary from resident to resident and are often dependent on where the resident is in their journey. But part of spiritual care, and our person-centered culture, is to meet residents where they are, with what they need at the time. “I remember Miss Norma, who resided at Southmont, our skilled nursing community in Washington. Norma would tell me that she wanted something to do and she often said to me that she could cook and clean as well as any of our employees. It didn’t matter to Norma that we took care of all of that for her – she was seeking to contribute in her new home,” reflects Gary. Norma was wheelchair bound with severe arthritis in her knees, but that didn’t stop her from requesting a broom and dust pan one morning when she spotted some dry cereal on the floor after breakfast services was over. This was the new beginning Norma had been looking for. She knew what her job would be and after each meal; you could find Norma with her broom and dust pan cleaning the floor to be sure it was all ready for the next service. By listening, addressing and making meaningful connections, our chaplains build relationships with our residents to help find the best ways to provide both meaning and purpose in their lives. “The favorite part of my job is that I get to be a keeper of stories,” shares Susan. One of the ways that our chaplains help residents reflect is through a Life Review. “Many, many residents who are facing advancing years or illness benefit from a life review. This can be in the form of their personal reflection; of talking with me or someone else, or even through a written review.” Through the reviews, our teams help residents to reconnect with memories of their families and of life’s adventures and achievements. For some, they connect with our belief in a higher power. To further enhance the life review process, Susan held “Spiritual Autobiography” classes for residents at Westminster Place, our personal care community in Oakmont. “We wrote stories of our past experiences, the things that made us into the person we are today, the things that have molded us and shaped us on our journey of faith.” The participating residents found that themselves writing short stories about their lives, and now, more than a year later, one resident continues to write about the people and events in her life. Across our Network, the chaplains have teamed up with our Information Systems team to explore new ways for technology to enhance worship services. Some of our communities are equipped with broadcasting equipment in the chapel; they are able to live broadcast the service and show it on our in-house television station. Residents who are unable to make it to service can watch worship in the comfort of their own room or apartment. With the help of the information services team, they are working to share available broadcasts with other communities around the Network. “Believe it or not, the favorite part of my job is visiting with residents who are having a health crisis or who are actively dying. I am grateful for the opportunity to help make a sacred place where residents and families can receive prayer and comfort,” Susan says. She continues, “There is an expression, a good death, and I firmly believe that reflective practice brings us peace.” According to Caring.com, by most standards, a good death is one in which a person dies on their own terms, relatively free from pain, in a supported and dignified setting. For 25 years, Ralph Phillips woke up each day, put on a suit and tie, and went to work at an investment management firm, of which he was the proud owner. However, after his father was diagnosed with Alzheimer’s disease, that all began to change. Ralph’s father battled Alzheimer’s disease for 10 years, and towards the end of his dad’s life, Ralph became more involved in the medical and day-to-day aspects of his father’s care. From doing things like taking vitals, administering medication and drawing blood samples, Ralph not only learned that he had a knack for providing care, but that he enjoyed that type of work. This realization changed his life. To spend more time with his father, Ralph sold his practice and some years after his dad’s passing, Ralph made another life changing decision – he decided to become a certified nurse’s aide (CNA). “I wanted to find something that I thought would be particularly meaningful and useful, so I decided to become a CNA,” said Ralph. In order to begin his new career, Ralph needed to properly prepare for the job, so he enrolled in the CNA Training Classes offered at Presbyterian SeniorCare Network. After completing the course and graduating, he began working at The Willows, the skilled nursing community at the Presbyterian SeniorCare Network Oakmont campus, where he has been part of the team for almost one year. Perhaps a bonus that ties to Ralph’s decision to sell his business and help care for his dad – he was able to coach girls basketball and volleyball, both sports in which his children play. Ralph says, “My dad's sacrifices when we were children made it possible for my brothers and I to participate in sports. When I sold my business, I was able to share my love of sports with my children by volunteer coaching.” The basketball he tosses is signed by all of the Mary Queen of Apostles girls he coached in 2014 – a very sentimental heirloom. Ralph’s life has certainly changed over the last few years, but he’s not slowing down. His passion for caring for others and his love for the job led him to the decision of returning to school to become a registered nurse. He begins school at UPMC St. Margaret on September 4. With 2018 being the 90th anniversary of Presbyterian SeniorCare Network, we want to show how person-centered is the heart and soul of our organization. All year long, we are asking for stories from anyone who has an experience with Presbyterian SeniorCare Network that they’d like to share - from our team members, to our partners, to our residents and family members -- tell us what moments that have touched your heart. Your stories help to bring our person-centered culture to life! A great example of a team member who found his calling at our organization is Stephen Braxton, a Maintenance Technician for SeniorCare Network, our supportive and affordable housing division. “My journey began at Home Depot. I always felt that my mission in life was to help others. I did not feel as though I was fulfilling that mission by working at Home Depot. Through God’s grace, someone from Presbyterian SeniorCare Network came into Home Depot and asked me if I was happy” I told him “no” as I knew something was missing in my life. When he told me about Presbyterian SeniorCare Network, I thought there may be a chance for me to actually help people. So, I left my position at Home Depot to begin my career at Presbyterian SeniorCare Network. My job here has been so fulfilling. It gives me so much happiness when I see a smile on one of my resident’s faces after helping them, and it does my heart good just to hear them say thank you. I've been working here for almost 3 years. One of the reasons I enjoy working with seniors is because I lost all four of my grandparents at an early age. Working here is like having 60 grandparents and it just gives me joy to be working around them. Like Stephen, do you have a story about Presbyterian SeniorCare Network that you would like to share? We would love to hear it! Click here to visit our 90th anniversary web page. Once there, please click on the button, Share My Story. Active on social media? Follow our hashtag #countlessmoments to see featured stories on Facebook throughout our 90th anniversary yearlong celebration. You never know who else enjoys coffee as much as you do, until you meet a special resident while going about your normal day-to-day schedule. One day Walt was talking with a resident at Longwood at Oakmont, and realized they enjoyed each other’s company. From there, they had an idea - meeting over coffee should be a daily thing! So every morning at 6 am they would meet in The Commons at Longwood at Oakmont, and discuss the daily campus happenings, sports, current events, politics and more! Walt says, "I’ve learned over the years to take advice from our elders, and he helped me quite a bit with his knowledge and insights. Like the time when my daughter bought her first house in Florida! I came to find out that he too had lived in Florida earlier in life. He was able to give me the ins and outs of water front property, HOA’s and other important factors that come along with home buying. Also, the advice he has given me has helped me grow and taught me to make better decisions; lessons I will remember for a lifetime." Walt’s story shows how person-centered our organization is and how we—make a difference! Like Walt, do you have a story about Presbyterian SeniorCare Network that you would like to share? We would love to hear it! Click here to visit our 90th anniversary web page. Once there, please click on the button, Share My Story. Once you have submitted your story, you will automatically be entered into a random drawing to win a $50 Visa gift card! Winners will be pulled the first Monday of every month through January 2019. A great example of how Presbyterian SeniorCare Network team members go above and beyond is the story of Taylor McMahon. Taylor has been a team member with Presbyterian SeniorCare Network for almost five years. She began her career as a LPN, continued her education and became an RN, and is currently a personal care assessment coordinator at Westminster Place, the personal care community at our Oakmont campus. Taylor shared a touching story of how forming a relationship with a resident, as well as special attention to detail, proved valuable to family members during a residents last hours. Her story highlights how our team members make a difference. I never thought I would want to work in the geriatric nursing field. Throughout nursing school, the stigma that comes with working with the aging population is that it’s so boring. My fellow classmates and I thought it may be a good first positon, we could gain experience before going to work at a big, exciting hospital. There we could finish our degrees and enjoy the fast paced setting of the ER. While that all sounded exciting, my views have since changed. Two years later, I am right where I should be and doing what I was meant to do, as a personal care assessment coordinator, at Presbyterian SeniorCare Network. My ah-ha moment came while I was caring for a resident at Westminster Place who was a former doctor, and was very special to me. He had moderate dementia and was well into his late nineties. Every day he would dress in a suit and tie and bring the warmest smile to breakfast. I would often let him use my stethoscope to auscultate my lungs and heart. He would tell me how healthy I sounded and said, “The bill would be in the mail.” As he declined, my emotions got the best of me. I would go home and cry because I knew what was coming. With the support of hospice we were able to give him the best care we could. With comfort as the goal, he received medication and we offered him the spiritual support he desired. One day, toward the end of my 3 pm-11 pm shift, I went to check on my buddy. I noticed his breathing was slightly different. Clinically, as a new nurse, I doubted myself at times, but tonight I didn’t. I called his daughter and told her what my assessment was. She said, “Taylor, do I need to come in.” I paused, “I will be right there,” she continued. I stayed late that night; and brewed her some fresh coffee and placed snacks outside of the resident’s door. The next day, I received information that he had passed away peacefully that night, with his daughter and son at his bedside. From that moment, it all made sense, I knew that caring for seniors is what I was meant to do. A few days later, with tears in her eyes, his daughter came into the nurse’s office and hugged me. She held onto me for several minutes and repeated, “thank you” over and over. She said that she could never repay me for making that phone call that night. She said that she held his hand all night until he passed. Yes, I was doing my job. I notified a family member that her father had a change of condition. However, to me this was much more than just a job responsibility. This was a blessing. Like Taylor, do you have a story about Presbyterian SeniorCare Network that you would like to share? We would love to hear it! Click here to visit our 90th anniversary web page. Once there, please click on the button, Share My Story. A great example of how Presbyterian SeniorCare Network team members go above and beyond, is the story of Sean Veshunfsky, a cook at Manchester Commons, one of our communities in Erie. Sean has been with Presbyterian SeniorCare Network for 11 years. Over his years of employment he has worked in various positions including cook, personal care assistant and neighborhood homemaker. Over the years he has created many great memories, his favorite from nine years ago. Like Sean, do you have a story about Presbyterian SeniorCare Network that you would like to share? We would love to hear it! Click here to visit our 90th anniversary web page. Once there, please click on the button, Share My Story.